HOLY FREAKIN’ COW! Widespread Panic will be playing Athens, Ga for the band’s 25th anniversary. 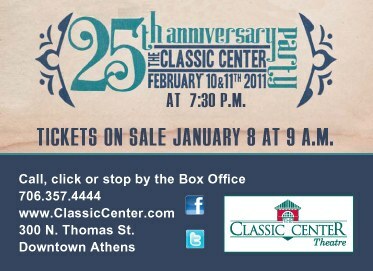 The band will play the Classic Center February 10th and 11th and in ATL on the 14th. Tickets are all $50 and go on sale THIS SATURDAY at 9 a.m. Showtime is 7:30 p.m. If memory serves the Classic Center sits on the site of the old Mad Hatter where Panic first played back in 1986. (update: yup, way to tell me what I need WP newsletter!) And we’ve got the B-52s coming the same month? I’m gonna have to stock up on Jittery Joes. You can check out a new R.E.M. track thanks to NPR. “Oh My Heart” can be heard here and here’s a nod to the boys from the Decemberists that features Mr. Peter Buck himself called “Calamity Song.” And have you seen Michael Stipe‘s new site? I’m pretty sure it’s on a 30 minute loop. If you can last that long. Oh, and it’s Mr. Stipe’s birthday today too. Happy Birthday Michael! Mark Yer Calendars: Athens Popfest is October 11-15th. Cee-lo says that Danger Mouse is wrapping up the new U2 project. Tealvox has a release show on the 15th at the Caledonia where they’ll be giving away the album. Sweet! Legend Of Zelda: The Musical. It’s real. UGA students created this epic piece of awesome that’ll play for two nights only on the 14th and 15th. Details here. You're this excited about Widespread Panic?